Jalapeño Poppers are always a hit at any party. These appetizers bring a nice bit of heat. Stuffed with cream cheese and smoked gouda then wrapped with thick center cut hickory smoked bacon slices. Mix the shredded smoked gouda and cream cheese with a wooden spoon in a medium-size bowl. With gloves on, cut the Jalapeños in half and spoon out the seeds and the ribs of the pepper. If you want extra heat, leave some of the white pith in the inside. Heap the cheese mixture into each jalapeño half. Wrap a whole slice of bacon around the jalapeño and cheese about three times, starting at one end and ending at the other. Tuck the bacon ends under the jalapeños with the cheese side up. Place the poppers on a wire rack that sits on a cookie sheet with parchment paper under it. Cook the poppers at 425°F for 30 minutes until the bacon starts to crisp a bit. Then turn the heat down to 375°F and cook for another 20 minutes until the cheese is bubbly and starting to brown and the jalapeños are nice and tender when punctured with a fork. Let sit for 5-10 minutes to cool slightly. They are extremely hot when they first come out of the oven. If you want a milder pepper, choose those that are bright green, plumb, and smooth in texture. These are the younger jalapeños. The ribs and the white pith are what actually holds the heat of the jalapeño. I’ve recently discovered that the seeds themselves have no heat at all, only that they are associated with the ribs themselves. For a little extra heat, you can leave some of the white pith in when spooning out the insides. If you’re wanting a lot of fire in your poppers, choose jalapeños that have white lines down the pepper, a little wrinkly and are shriveling just a bit, which all indicates they are older and hotter. You can use whatever cheese with the cream cheese you like. I wanted a smoky flavor, so I chose smoked gouda. Add some more spiciness by choosing shredded pepper jack. A nice all around good choice is always sharp or mild cheddar. Whatever substitute you use, it needs to have a good melting quality but somewhat firm to give the poppers body. When handling the jalapeño peppers, please use gloves. They have a fiery burning effect to your skin that can last for several hours otherwise. You can cut off the stem if you like. But I think it adds some character to the end product, so I left them on. When filling the jalapeño halves with the cheese mixture, make sure you heap it in. You want to be able to taste the blending of all three components – the pepper, the cheese, and the bacon. 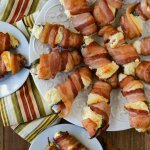 Use a whole slice of thick bacon for one jalapeño popper, because you don’t want the bacon getting lost in the mix. Also chose center-cut bacon because it is a leaner cut and doesn’t shrivel up as much when cooked. If you decide to go with a smaller jalapeño, you could possibly cut the bacon slices in half. But the poppers need to be well covered when wrapping them with bacon. Start at one end of the jalapeño and wrap the bacon around about 3 times to the other end. Both bacon ends should be tucked under the bottom of the pepper with the cheese side up. There’s no need to secure them with toothpicks. The bacon, when it cooks up, tends to cling to the poppers especially if they’re secured well under each end. I baked these on a wire rack over a parchment covered cookie sheet. It helps the heat permeate all around the jalapeño poppers and cook evenly.